In Overwatch competitive season 12, most players play only one hero across all skill ratings, while the players that flex from support, damage, and tank roles are in the minority, according to the latest report from the OmnicMeta. 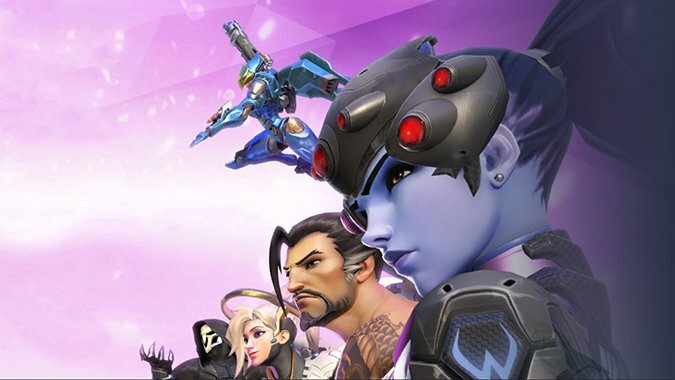 The site draws a significant amount of player profile info via raw web searches and the Blizzard API, and its data has found this latest season of competitive on PC is full of people playing the same heroes consistently. 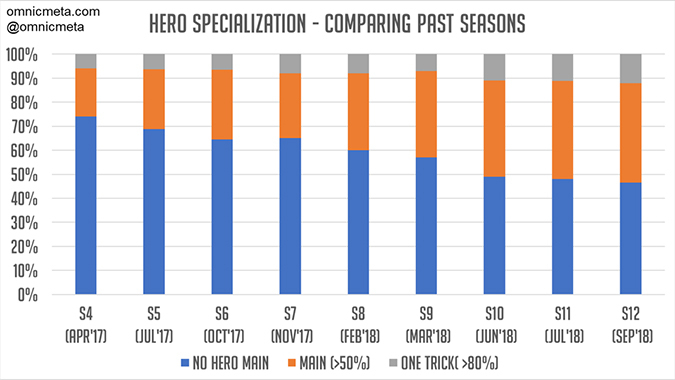 “In Season 4, only 25 percent of players were specializing in a hero, but now around 55 percent of players are specializing,” the site reports, defining players that spent over 50 percent play time on a single hero as a main and over 80 percent as a one trick, or someone that actively refuses to play other heroes. Those main heroes tend to be particularly strong meta picks like Ana, Reinhardt, Moira, Lucio, and D.Va. The heroes change a bit from different ranks like Bronze to Grand Master, but there’s a general consistency to what people solely play in competitive, which is a fairly new occurrence from past seasons. Some of that can be attributed to new additions like the Looking For Group tool that lets players pre-choose a role to play and stick to within a team. Trends like hero balance changes taking heroes with clear specializations — think Junkrat, Hanzo, and the upcoming reworked Torbjorn — have let most heroes stay good across different maps and various team compositions. And, generally, it pays to play one hero a lot in order to improve and eventually climb the competitive ladder. Notably, the OmnicMeta can’t speak for the huge number of players that still have the default private profiles enabled, but even other sites like Overbuff show similar hero pick rates in competitive. What does this mean for casual players or people not especially vying to get into Top 500? It shows a big shift in Overwatch’s philosophy of swapping heroes to meet your team’s needs. There was a time where certain heroes had huge weaknesses and specific strengths. That reality is not only going away mechanically, but it’s being overridden by the general level of player skill and understanding going up — be it from experience or emulation from things like Overwatch League. Professional play and competitive play are starting to find the most efficient and safe ways to excel and it’s starting to trickle down to even the lowest ranks of competitive. Clearly, if you want to get better at Overwatch, you should find a hero you like and stick to it.